Hi-Rez Studios, independent developer of AAA free-to-play online games and MANOWAR, the band known worldwide for mythology-themed lyrics and an epic heavy metal sound, today confirmed their collaboration around the game SMITE. A new SMITE video was released featuring god vs. god gameplay footage set to the popular MANOWAR song, The Sons of Odin. The game SMITE is currently in Beta and will release in Q1 2013. 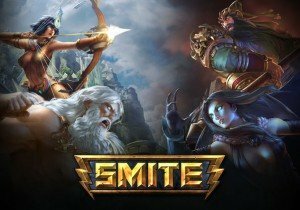 Within SMITE, players choose from a selection of gods, join session based 5 versus 5 arena combat, and use custom powers and team tactics against other players and minions. SMITE is free-to-play and is a digital download for the PC. Players interested in joining the SMITE Closed Beta can register for an invitation at http://www.smitegame.com. MANOWAR will kick off leg 1 of The Lord Of Steel World Tour with first dates in Europe and the US in October and November 2012 celebrating their newest studio album “The Lord of Steel” (digital release on October 9, physical on October 19). To pre-order the album visit http://bit.ly/OS39zw.